You guys, this is awesome. Really awesome. Awesome like a mug of warm mint chocolate on a chilly autumn day, like a day at the Spa, like a sink without dirty dishes, like running 10k under 35 minutes — that kind of awesome. A really awesome Creamy Crock-Pot Chicken Arrabbiata that is delicious, full of flavor, with a homey feel to it — it’s guaranteed to give you a longing to come back for more. And you know what’s even better about this recipe? How simple it is. Minimal yet so loud. Which happens a lot with Italian food. And then you make it and wonder why you’ve ever previously bothered making or eating anything complicated. No, it’s not a social disease. It’s basically a marinara sauce spiked with chili peppers for heat. The literal translation would be “angry”, “furious” or even “in a rage” chicken — from the heat of the chili peppers. I suppose how angry is determined by how hot you decide you want to make that red sauce. My version of spicy chicken is more like mildly ticked off. But you can go off the charts angry, if that’s what you like. To make my chicken arrabbiata I use a combination of red pepper flakes, cayenne pepper, and smoked paprika along with lots of tomatoes. But feel free to use chili powder if that’s what you have. Just make sure that the spiciness is as desired. As with most Crock-Pot recipes, this one is as simple and easy as can be, it does not require your full concentration, and it won’t cause any furrowed brows. Plus it’s very forgiving on time. You just throw everything in and forget about dinner until the end of the day. By the time you come back, the house will be filled with heavenly aromas. I like to serve Chicken Arrabbiata over zoodles or with crisp green salad to cool the heat but if you’re into pasta this works beautifully over penne. 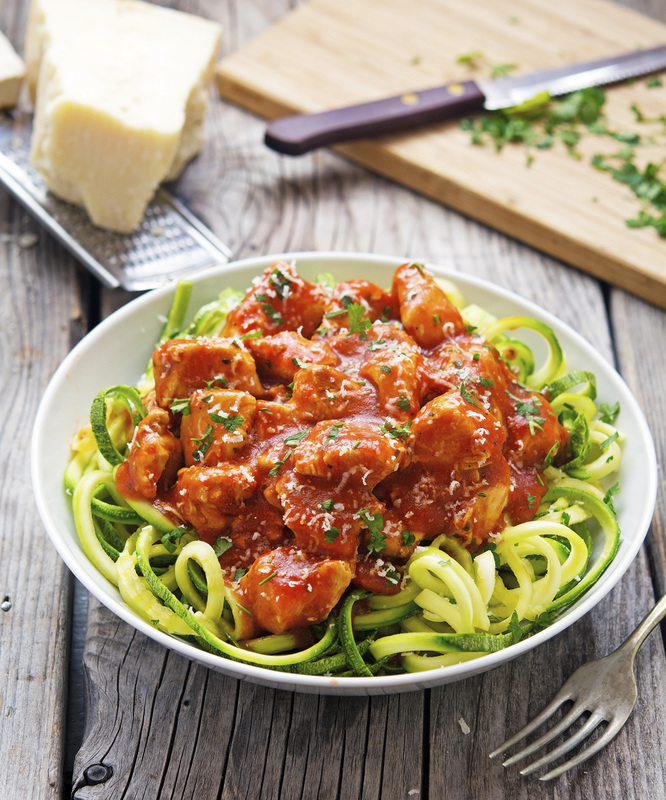 Creamy Crock-Pot Chicken Arrabbiata Print this recipe! In a bowl combine diced tomatoes, crushed tomatoes, tomato paste, olive oil, broth, white wine, basil, red pepper flakes, arrowroot (or cornstarch), salt, and pepper. Set aside. Grease the inside of your Crock-Pot bowl with a bit of olive oil. Add garlic at the bottom of the Crock-Pot, then chicken chunks, and then pour tomato mixture over it. Cover with a lid, and cook on high for 4 hours or on low for 6 hours. When ready, give a good stir, adjust seasoning, sprinkle with fresh chopped parsley, grated Parmesan, lemon zest, and serve. 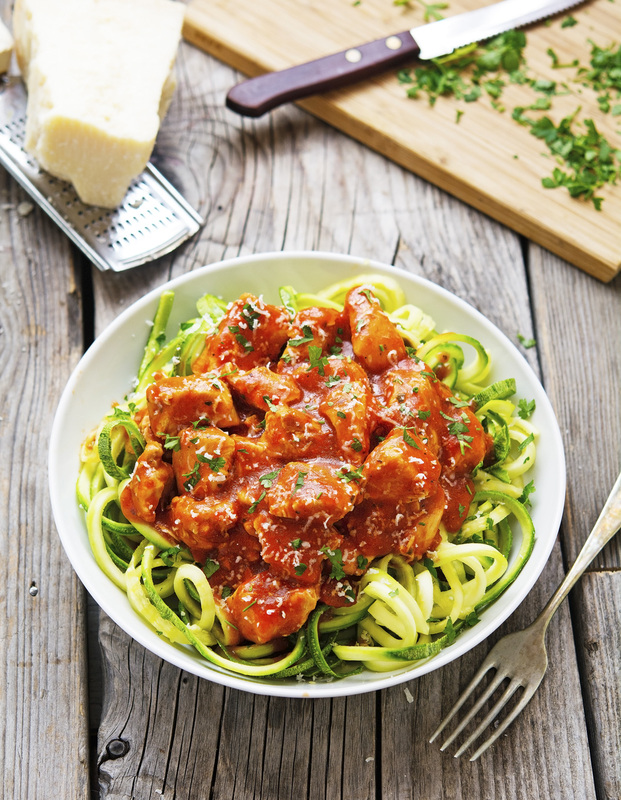 One serving yields 342 calories, 10 grams of fat, 9 grams of carbs, and 49 grams of protein. This looks awesome! 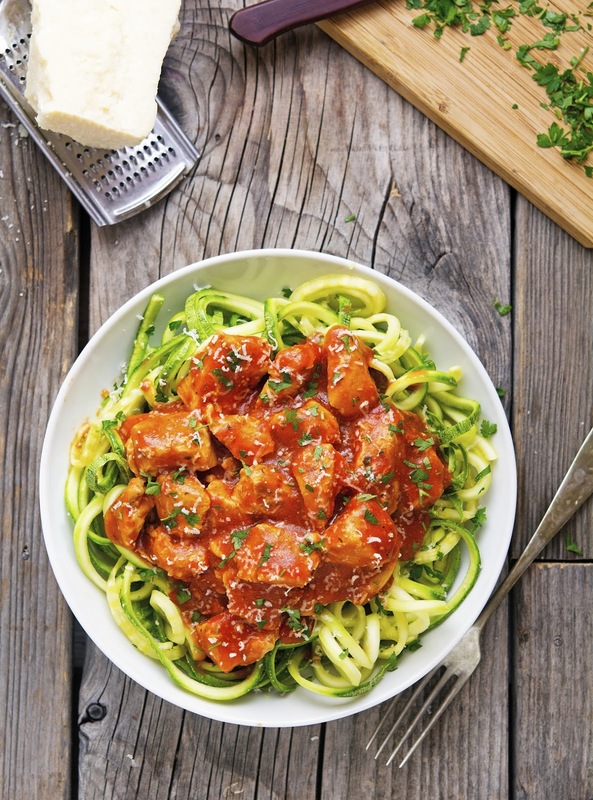 Love that you served in w zoodles! That does look amazing! Yum! Love how healthy this is while still technically being comfort food. Even though I'm a very kind guy (occasionally, I mean), I do love arrabiatta! It might balance me out, ha-ha. And what a delicious version an of old good classic! I definitely want to try this! I have been looking for more crock pot recipes. I have been craving pasta dishes for a week! I really like the noodles you used. I have been wanting to make those for a while. I'm convinced. 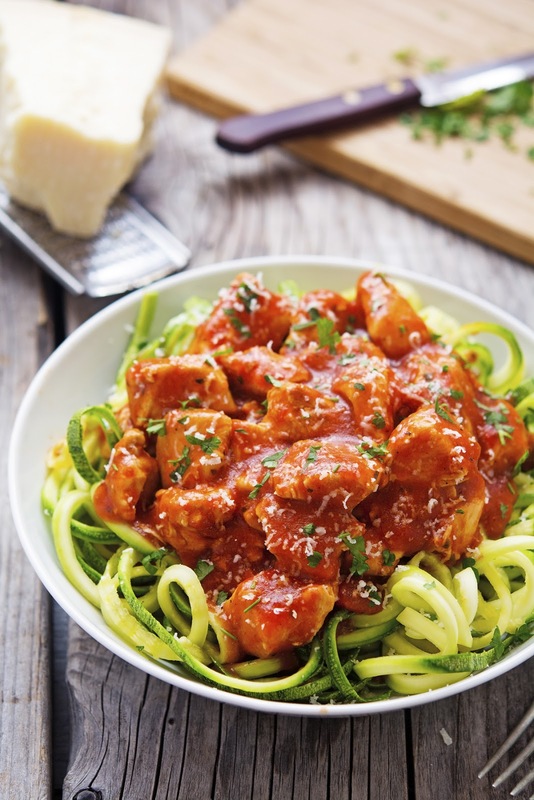 I NEED to try zucchini noodles. This looks so healthy and delicious. I'm sold! This is so beautiful... love the spice of red pepper flakes in just about everything. 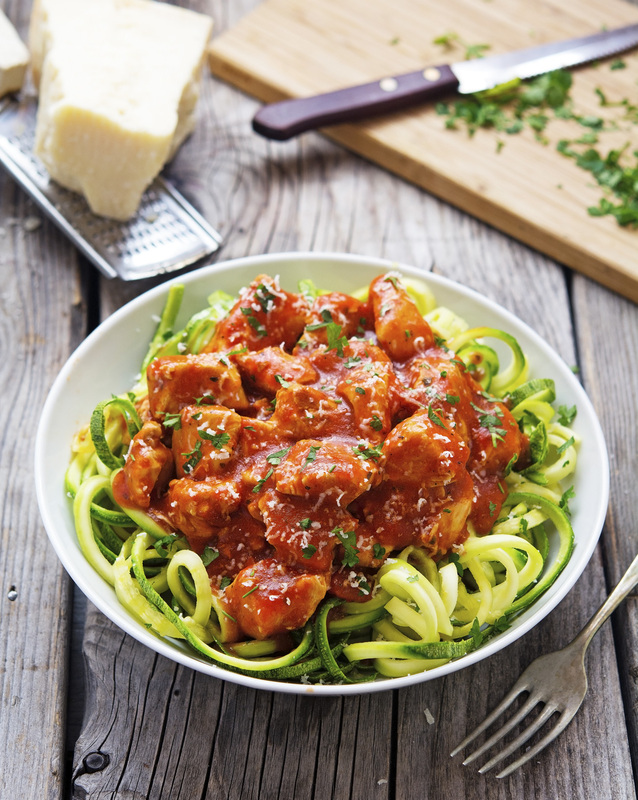 You are the Zoodle King. I just dug my crockpot out to make some chili, but after that, this one is on the menu for next week! I love the simplicity and creamy sauces are my downfall! Great recipe but... what is it with food bloggers who insist on posting the same picture over and over, with a slightly different angle? We don't need the load times! Just give us the recipe! I made this and it is very watery. The sauce is not thick at all and I did use cornstarch. What can be done about this for next time? What is the serving size of this meal?